An Interview with Carl Cannon. · One Book. One Author. One Hour. 1:35 – Carl Cannon is uncertain how his book came to be on Booknotes but he was delighted to have been asked to be a part of the show. 1:57 – Cannon did not prepare very much for his interview, thinking that “he either knows this stuff or he doesn’t.” But he did get a haircut in preparation of being on television. 2:31 – What Cannon remembers most from the interview was the question “Correct me if I’m wrong, but I don’t think that you wrote a negative word about a President?” To this Cannon replied jokingly that this was because he did not write about Richard Nixon. Brian Lamb did not laugh but instead pushed Cannon to explain the meaning of his book. Cannon’s book discusses American exceptionalism, happiness, and the use of the Declaration of Independence in American political discourse. The meaning of this book is that Americans have a responsibility to constantly expand liberty to those who do not have it, at home or abroad. Cannon was not able to briefly synthesize the meaning of his book in this way until Lamb pushed him to do so. 3:48 – Cannon brings up how prepared Lamb was for the interview and how rare it is for interviewers to have read the books that are being discussed. 6:01 – Cannon was surprised by Lamb’s question of whether he himself was a happy person since he was writing about happiness. He was also surprised by the question “what makes people happy?” His answer to the latter question was satisfaction in one’s work. 8:22 – Cannon was pleased that Lamb asked about his father, who was also an author who appeared on Booknotes. 8:47 – Cannon was also surprised by the question of whether Presidents were happy. He had not given much thought to this before the question. 11:41 – Hour long television interviews could lead to long winded and unfocused answers from authors. Possibly some people do not need a full hour to discuss their books. However, Cannon holds that you need much more than the two or three minutes of interview time most networks provide. The Booknotes format allows for a more meaningful conversation. 13:02 – Authors are always surprised when they are asked about the personal aspects of writing. But Cannon knows that the reading public finds these human details interesting because those are the most common questions he is asked. 14:55 – Biographical questions are important. Lamb isn’t alone in asking these kinds of questions. Especially today people want to learn about authors’ perspectives and past experiences. 16:22 – Cannon did watch Booknotes before and after his own appearance on the program. He never expected to be asked to appear on the program. He was not afraid of Lamb’s unique questions or probing style because he was familiar with them as a viewer. 18:35 – Cannon thinks that the GMU Booknotes collection is a great resource, especially for history. He thinks that by going back through the notes made within Lamb’s personal copies of the books you will have a special understanding of Lamb’s opinions and perspectives. 20:10 – Cannon is not sure whether his appearance on the program affected overall sales or critical reception for his book. The book sold very modestly. 21:06 – Lamb influenced Cannon’s interviewing style by pushing him towards asking fewer questions, instead letting the interviewee take the lead and do most of the talking. Lamb keeps the focus on the author and does not offer his own opinion, which puts people at ease. This is because even though he won’t necessarily agree with you, he won’t attack you either. 23:03 – Since appearing on the show Cannon has written four more books. But The Pursuit of Happiness in Times of War is still the work he is most proud of. It was his first book. 24: 19 – Cannon thinks that Lamb and what he did with this show set a marker, a high bar which others strive for. It shows that high discourse is still possible in modern American media. Because of this, he is happy that the show’s collection of books is being preserved. 25:46 – Cannon thinks that Lamb is a great national resource and that Booknotes is some of his best work product. Lindsey Bestebreurtje (Oral Historian), “An Interview with Carl Cannon.,” One Book. One Author. One Hour., accessed April 24, 2019, http://booknotes.gmu.edu/items/show/2779. 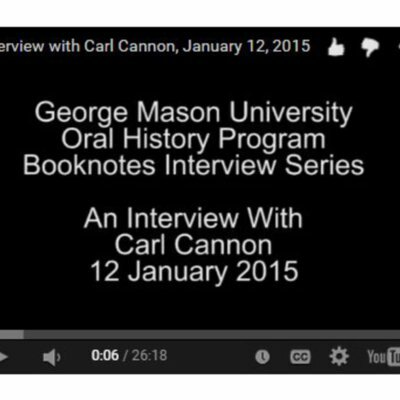 Carl Cannon is interviewed as part of the Booknotes Oral History Project on 12 January 2015. Mr. Cannon discusses his appearance on C-SPAN's Booknotes program on 28 December 2003, where he discussed his book "The Pursuit of Happiness in Times of War." Booknotes Oral History Series. R0143 Box 02 File 05.